Kerry James Marshall has steadily risen since the early 1990s to become one of the most celebrated of American painters and one of a handful of contemporary African Americans whose canvases routinely sell in the six-figure range. His widespread recognition began in 1997 when he was awarded the coveted MacArthur Prize. In Our Town, his most well-known painting of that formative period, a coal-black boy and girl romp in a charming, storybook neighborhood usually populated by rosy-cheeked, fair-skinned children. 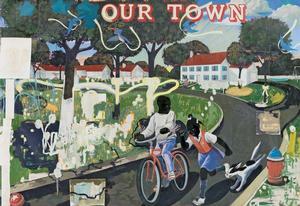 The idyllic scene is disrupted by a messy, graffiti-like smattering of paint in the foreground – shades of the hood. The enigma of unalloyed blackness in all kinds of settings continues to define his work. 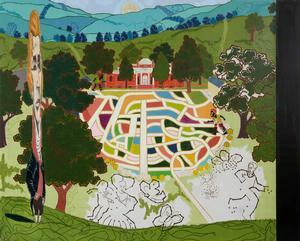 Now Marshall’s first solo exhibition in Washington, D.C. (June 28–December 7, 2013) is attracting art enthusiasts of all backgrounds to the National Gallery of Art (NGA). In the Tower: Kerry James Marshall was kicked off by an intimate, standing room only talk between the artist and NGA’s curator of modern art, James Meyer. 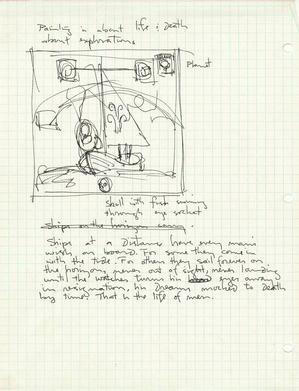 During his talk with Meyer, Marshall discussed how he works on setting up a “meditative space” for the viewer and described how he wants his works to have “a long reading time,” instead of revealing all at first glance. 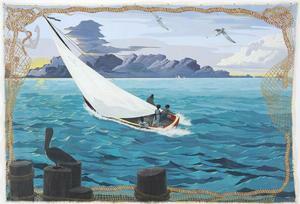 Marshall’s work on view at the NGA has a re-occurring theme of water. 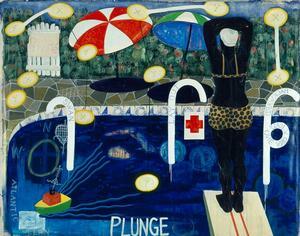 In his painting, Plunge, set in a suburban America, the diver takes a plunge into the Atlantic Ocean. The red cross embodied in the painting — a symbol in a number of his works — can be thought of as indicating a state of emergency or an intersection, meaning a place of exchange. Marshall explained that most of us have a “shallow understanding of histories.” In Plunge, the diver seems apprehensive about taking that plunge which is sometimes representative of how we take on history: “Afrocentricity as backwards one and a half”, explains Marshall. The idea that blacks can take back things stolen from African Americans, the idea that only when you go back can you go forwards. Even in the painting that does not blatantly show a body of water, Our Town, there is the water metaphor of a pool and water hose. The exhibition presents 10 paintings and more than 20 works on paper, affording a context for understanding the Gallery’s own Marshall painting, Great America (1994), and its powerful imagery. As a group, these paintings evoke the Middle Passage of slave ships between West Africa and North America, and the themes of immigration, class mobility, and aspiration central to American life. 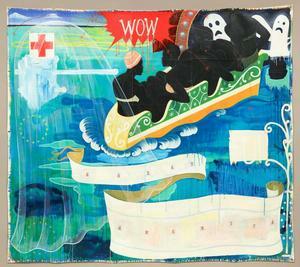 The enormous piece The Gulf Stream (2003) was inspired by Winslow Homer’s famous painting of a black man on a shipwreck surrounded by sharks (1899, The Metropolitan Museum of Art). In contrast to Homer’s doomed survivor, Marshall’s middle-class family enjoys a leisurely sail on the open sea as gray clouds gather on the horizon. In Bang (1994), an image of the Fourth of July, a girl holds up the American flag while two boys say the Pledge of Allegiance in a neighborhood of white clapboard houses and picket fences. Two doves hold up a Revolutionary War banner (“Resistance to tyranny is obedience to god”), while the text “We Are One” from the Great Seal of the United States is painted below. Yet the round-topped Weber grill emits a coil of black smoke, and a garden hose—suggestive of the water hoses used against the children who marched for civil rights in Birmingham, Alabama, in 1963—encircles the girl like a snake. The sailboat named Wanderer in Voyager (1992) recalls the last documented slave ship, which set sail from the Congo and landed in Jekyll Island, Georgia, in 1858. In Baptist (1992), a figure treads water in the ocean between Africa and North America. One of the most fascinating things about Marshall’s paintings is the black skin tone of the African American figures. This stems from Marshall’s observations about the invisibility of blacks in America and the negative connotations associated with darkness. When asked by Meyer, why he chooses to paint the figures in that manner, Marshall responded it creates a flattening effect. Marshall explained how he started out painting very black people on a black background – designed as a rhetorical device, which projects power and presence. It attracts the viewer’s attention and works to connect to absence, invisibility and visibility. Marshall also noted that it goes back to the idea of “representing the unrepresentable”. Marshall remains committed to the representational tradition of American history painting. His work explores the experiences of African Americans and the presentations of American history that often marginalize black people. In the Tower: Kerry James Marshall was conceived by the NGA following the 2011 purchase of Great America by the Gallery’s Collectors Committee. 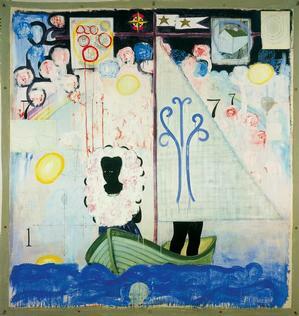 This painting is the centerpiece of the exhibition, which brings together a sequence of related paintings and drawings to explore important themes and imagery woven throughout Marshall’s work. 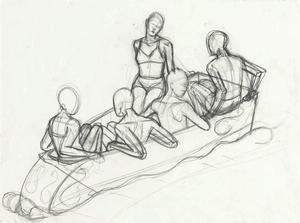 Great America depicts two couples in a small boat exiting an amusement park Tunnel of Love ride. Named for an amusement park that Marshall visited as a child, this seemingly innocent scene of middle-class leisure is filled with troubling details, such as the appearance of ghosts in the dark tunnel, the bobbing head of a man in the water, and an abstract shape, painted in thick brushstrokes, pointing at a woman's head like a rifle. 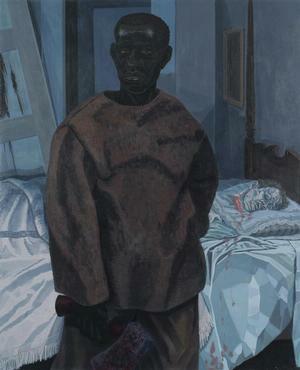 Other paintings drawn from museum and private collections from around the United States include Nat Turner with the Head of His Master (2011), a painting in the old-master tradition of images of freedom fighters (including the Gallery’s painting by Andrea del Castagno, David with the Head of Goliath, 1450/1455), and the maquettes for Marshall’s 2008 celebrated pair of frescoes at the San Francisco Museum of Modern Art that portray President Washington at Mount Vernon and President Jefferson at Monticello, respectively. 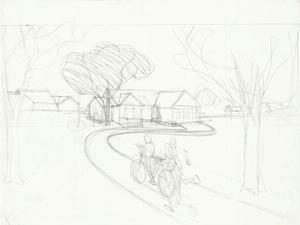 The exhibition also includes more than 20 preparatory drawings for many of these works. Born in Birmingham, Alabama in 1955, Kerry grew up in South Central Los Angeles, California, during the Civil Rights and Black Power movements. After experimenting with abstraction and collage at Otis Art Institute, where he received his BFA, Marshall came into his more realist style. He is known for his monumental scale paintings (the size lends to the narrative aspect of his paintings), installations and sculptures. 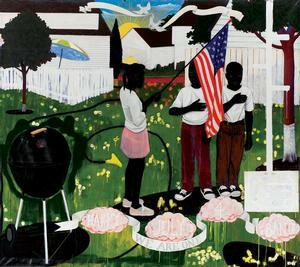 His works combine his knowledge of art history and the history of the Black Diaspora with elements of popular culture. Having been recognized internationally for his art, Marshall has shown his artwork at the Venice Biennale (2003) and Documental (1997 and 2007), and has been the recipient of the MacArthur Fellow. This exhibition coincides with the 50th anniversary of the March on Washington for Jobs and Freedom and the 150th anniversary of the Emancipation Proclamation. The Gallery will also honor the 150th anniversary of the Battle of Fort Wagner this fall with the exhibition Tell It with Pride: The 54th Massachusetts Regiment and Augustus Saint-Gaudens’ “Shaw Memorial” (September 15, 2013–January 19, 2014). Schwanda Rountree is an attorney, art collector and principal of Rountree Art Consulting.